Backpackers hiking California's high, scenic trails often feel as close to paradise as they will ever be. Wandering among the rocky forested basins, lush meadows, and sparkling lakes at timberline opens top-of-the-world views. With snow-capped peaks above, wild-flower gardens in the seepages, and marmots sunning on the boulders, life can seem wondrously serene. These delights on a congenial August day tell only part of the story. Harsh environmental conditions prevail in this zone most of the year. The Subalpine Forests that live at timberline, where trees straggle to their upper limits, climb there through a land ruled by rock and weather. Massive granite slabs, many polished to mirror brilliance by glaciers, hold large erratic boulders stranded eons ago by that same moving ice. Talus slopes of jumbled rock rise to rugged crests. In many areas, the only soil hugs tiny pockets in rock crevices. Fierce winds pick up the shallow, coarse, decomposing granite and blast off the windward sides of trees on exposed ridges. In a winter that may last ten months, temperatures range from roasting to below freezing, with frost possible any night of the year. The only available water is from winter snowmelt, save for an occasional summer thunder shower. Solar radiation is intense. Not many plants or animals can handle such extreme environmental conditions. The species that succeed have evolved special adaptations to subalpine rigors over time. The ways in which they combat the elements and spread their progeny over this beautiful but relentless landscape make a remarkable story. California's subalpine domain covers roughly 8,000 to 11,000 foot elevations (2,400 to 3,300 m), with variations in species, as usual, in different parts of the state. The extensive Subalpine Forests of the Sierra Nevada, which lie just below the summits along 200 miles of the central and southern part of the range, will serve as our model of subalpine ecology, from which to explore briefly subalpine areas of California's Cascades and Warner and Klamath Mountains. The drier subalpine heights of southern California's mountains merit separate coverage, as do the inimitable subalpine Bristlecone Pine Forests of eastern California's White Mountains. Map 10. Subalpine Forests and Bristelcone Pines. The Whitebark Pine (Pinus albicaulis) is the most characteristic treeline conifer in the Cascades, Warner Mountains, and Sierra Nevada. In the Cascades, Whitebark Pines share timberline with Mountain Hemlocks (Tsuga mertensiana) and Shasta Red Fir on Mount Shasta. They also grow commonly on the high ridges of Lassen Volcanic National Park above a Mountain Hemlock zone and occur in scattered stands on several nearby Cascade summits. The Warner Mountains of northeastern California hold just one peak rising to tree limits, Eagle Peak, at 10,000 feet (3,000 m), which support bands of Whitebarks. In the Klamath Mountains of northwestern California, Whitebark Pines form open woodlands of dwarfed trees above high mountain meadows. By far, the majority of Whitebark Pines in the state live in the Sierra Nevada. From the Tahoe region south to Mount Whitney, they cover an extensive high mountain realm. Growing as widely spaced trees on protected slopes, they stand 30 to 40 feet tall (9 to 12 m) with rounded crowns, silvery white barks, clustered needles (five to a bundle) at the ends of exceedingly flexible branches. Elsewhere, they form thickets, with multiple trunks sheltering resting hollows of White-tailed Jackrabbits, Mule Deer, and Bighorn Sheep (Ovis canadensis). Their knee-high elfinwood mats, often thick enough to hold a heavy hiker, march up to the 12,000-foot level (3,600 m). The species' genetic ability to grow low and horizontally enables it to survive the gales of heights well beyond the reach of its competitors. Mountain Hemlocks also exhibit the inborn variability essential for success in both the upper and lower reaches of the subalpine zone. In the lower stretches they form almost pure groves in north- or east-facing canyons, where snow lingers well into summer. Tall, narrowly conical trees with soft bluish green needles that look starlike from above, Mountain Hemlocks carry a slightly nodding tip and add a grace to the stately forests where they frequently associate with Red Firs and Lodgepole and Western White Pines. In the northern Sierra, hemlocks are the dominant subalpine species. But as Mountain Hemlocks ascend the higher rockbound slopes to 1,000 feet past their regular treeline in the central and southern Sierra, they assume the form of sprawling shrubs and gnarled mats close to the ground. The powerful winds that would scour an erect tree trunk bare and knock off its crown, will ride up and over a horizontally growing mat, merely shearing its top. Trees that have evolved this low form of elfinwood (known botanically in German as krummholz, for "crooked wood") are the common survivors in mountain heights around the world. Lodgepole Pines which occupy sunny open slopes and flats in the lower subalpine belt as full forest trees have been slow to evolve the elfinwood mode of survival. As individual Lodgepole Pines climb toward timberline, most of them retain their erect, weathered stance as far up the heights as the elements allow them to grow. However, in a few areas, these pines are showing the genetic ability to form mats. Sierra Junipers (Juniperus occidentalis var. australis) survive both ways in subalpine terrain, as mats and as erect trees. Short, thickset, cinnamon-trunked junipers form almost the sole species spaced over miles of granite domes and rocky outposts, their roots delving into seemingly hopeless rock fissures in successful quests for water. In the shelter of large boulders, junipers spread a tough horizontal mat of tight-fitting scaly leaves, angled like a roof to deflect winds up and over. Many of their wind-polished, half-bare, silvery trunks bend to buffer the low green growth in their lee. Growth is slow for all trees in the austere mountain heights, varying greatly with local exposure, wind abrasion, sun, and the amount of snowmelt. Junipers growing in totally unfavorable microsites have been found to produce 136 annual rings in 2 inches (5 cm) of trunk cross-section. Like fellow slow-growing subalpine trees, they attain ripe old ages of 1,000 to 2,000 years or more. The Bennett Juniper near Sonora Pass, 85 feet tall (26 m) and 14 feet in diameter (4 m), has been estimated at 3,000 years. Whitebark Pines may live 1,000 years. John Muir counted annual rings on a shrubby Whitebark Pine that was huddled behind a boulder at treeline. The 6-inch-wide trunk (15 cm) was 426 years old. Just a slight earth rise or hummock makes a world of difference in the microsite of a tree or wild flower. Studies show that an inclined surface facing the sun receives half again more heat and light than a level surface. The importance of this added warmth to seedlings lucky enough to germinate in such favorable spots can be immense. Inclined surfaces also influence the distribution of the lovely White Heather (Cassiope mertensiana), the yellow-throated magenta Sierra Primrose (Primula suffrutescens), the red Mountain Heather (Phyllodoce breweri) and other wild flowers scattered among the rocks and crannies of the subalpine zone. The conifers of the high rocky slopes disseminate their seeds in a number of different ways. Sierra Junipers produce bluish berrylike cones whose seeds will not germinate unless they have passed through a bird or mammal digestive tract. Townsend's Solitaires, Coyotes, rabbits, and Martens, among others, act as willing agents. Hemlocks and most pines rely on the wind to disperse their winged seeds, which are kept tightly sealed in cones until maturity. Whitebark Pine seeds are wingless when they leave the cone. Ordinarily this would doom the seeds to drop beneath the mother tree, but Whitebarks have no problem spreading their progeny widely over the high country. The story behind this involves a singular relationship with a bird as much at home in the heights as the pine itself, Clark's Nutcracker (Nucifraga columbiana). A little smaller than a crow, gray with black and white wings and a sturdy, sharp bill, Clark's Nutcrackers begin feeding on Whitebark Pines in late summer, stripping first the closed purple cones and later the dry brown ones of their seeds. They eat some of the seeds on the spot, but the majority fall into a pouch on the floor of the bird's mouth. Roughly 150 Whitebark Pine seeds can fit into the pouch. Only two nutcracker species in the world own such pouches: Clark's in North America and the Eurasian Nutcracker (Nucifraga caryocatactes) in Europe and Asia, and both use it in the same way. With a pouchful of seeds, the bird can still call its harsh "churr" as it flies to one of its specially chosen cache sites, often across ravines or ridges up to 12 miles away. Here it jabs its long, strong bill into the soil to make holes, one at a time, bringing up the pouched seeds and inserting from one to fifteen of them about an inch (2.5 cm) into the hole. It then rakes soil or litter over the burial spot before moving on to the next hole. Favorite cache areas are south-facing slopes and ridges that are free of snow early in the spring, making the stored seeds accessible as both winter and spring fare. Such sites are scarce, and the birds often join in communal caches. Nutcrackers live off their cached seeds until the seed crop of the next summer and show remarkable long-term spatial memories in relocating 60 to 90 percent of the caches. Research in the Rocky Mountains and in the Sierra Nevada has indicated that the birds apparently remember certain nearby landmarks such as trees, shrubs, logs, and boulders and triangulate the angles between those and their caches. Even when snow covers some of their cues, they can retrieve seeds from beneath the snow. Nutcrackers belong to the same family as jays and crows, which are considered among the most intelligent birds. Figure 31. Whitebark Pines provide nuts for Clark's Nutcracker and shelter for the Snowshoe Hare at treeline. Since nutcrackers feed themselves and their young almost entirely on pine seeds, aside from occasional forays into insects, carrion, bird nests, and juvenile Belding's Ground Squirrels, they stash huge numbers of the nuts. Nutcrackers studied in Wyoming's Rocky Mountains each cached an estimated 98,000 Whitebark Pine seeds one autumn of a prime seed year. Sierran nutcrackers regularly cache up to 30,000 seeds. Such widespread storage means thousands of cache sites for the birds to remember. It also means that many more seeds are buried than Clark's Nutcrackers need to survive. Some of the unrecovered seeds germinate in the snowmelt of the high country summer. Eventually groves of Whitebark Pines mark the old nutcracker caching sites. Thus the bird and the tree benefit each other in a mutually useful relationship. The nutcracker transports wingless Whitebark Pine seeds over canyons, ridges, and glacier-carved cirques, unwittingly acting as a colonizer. The pine, in turn, provides a food supply of nuts rich enough in fat and protein to nourish nutcracker adults and young most of the year. While Clark's Nutcrackers act as the chief dispersal agents for Whitebark Pine seeds, they are "aided" by Deer Mice, chipmunks, and Douglas Squirrels, which all live at subalpine elevations and make numerous large seed caches. Deer Mice collect seeds from open cones. Their sense of smell is so keen that they probably relocate and eat most of their stores. Chipmunks climb the trees to harvest seeds, and disseminate some of them. Many of their caches are used up during hibernation. Douglas Squirrels nip off Whitebark Pine cones en masse during late summer and store them in heaps at the base of trees. The seeds remain inside the intact cones until eaten and probably only rarely reach ground favorable for germination. Other mammals inhabit the subalpine rock slides. The Yellow-bellied Marmot (Marmota flaviventris) digs a den under piles of boulders anywhere from the Red Fir and Jeffrey Pine Forests at lower elevations to the rock avalanche areas at timberline. Everywhere it keeps an alert eye on its surroundings from a commanding perch atop a large rock or log, whistling a sharp warning to its fellows if intruders appear. In leisure moments, it spreads its body like a pancake on the granite, soaking up the sun. The heavy bodied, short-legged marmot, about 2 feet long (.6 m), grizzled brown above and yellowish brown below with a mixture of black and white on the face, is the largest of the commonly visible high country rodents. Strictly a vegetarian, it grows fat during the summer months on the tender leaves and stems of grasses, wild flowers, and shrubs, as well as fruits and berries. But these short trips to minigardens within reach of its den always pose risks; predators such as Coyotes, Mountain Lions, or even rare native Red Foxes (Vulpes vulpes) may lurk nearby. As winter approaches, the marmot retreats to its grass-lined den under the rocks. A complete hibernator, unlike bears and chipmunks, which awaken off and on during the winter, it curls up and sinks into a deep sleep. Its heartbeat drops from 100 beats a minute to four; its body temperature falls from 97\sz\F to 40\sz\F (36\sz\C to 5\sz\C); it breathes about once in 6 minutes and lives on its fat. In other burrows among the talus slopes. Golden-mantled Ground Squirrels hibernate just as soundly. But the sprightly Pikas or Conies (Ochotona princeps), snug in their rockbound dens under the snow, move about during the winter, selecting food from the haypiles of grasses, sedges, wild flowers, pine needles, and shrubs which they collected, sun-dried,and carefully stored during the summer. When winds blow snow away from their entrances, these little mammals emerge to nibble lichens off the exposed rocks or push through snow to nearby meadows, where they feed on the tips of plants extending above the snowline. Even when 15-foot drifts imprison them within their chambers, they occasionally issue thin, high-pitched calls from below. Resembling roly-poly bundles of grayish tan fur, with a short head, round ears, and no visible tail, the 7-inch-long Pikas (17 cm) fit their high mountain environs to a tee. With an average body temperature of 104\sz\F (40\sz\C) and thick fur, they thrive on cold and cannot tolerate heat. A dozen species of them exist in the mountains of Asia; two kinds occur in North America, one in Alaska and one in the Sierra Nevada-Cascade chain and the Warner Mountains of northeastern California. In summer, Pikas share the broken rock piles of California subalpine areas with Yellow-bellied Marmots, Bushy-tailed Wood Rats (Neotoma cinerea), chipmunks, Golden-mantled Ground Squirrels, and their chief enemies, weasels and Martens. Very territorial, Pikas mark their own rock boundaries with secretions from eye and cheek glands and reinforce ownership with nasal bleats from rocky lookouts. With every bleat, the whole body jerks forward and the ears twitch upward in an all-out effort. The small face often bears a semi-inquiring expression. Although squat, the Pika is very agile. It can spring 10 feet while bounding from rock to rock, the bare toe pads on its furry feet providing superb traction. It uses this agility in summer to reach nearby rock gardens where it cuts off choice green plants and carries mouthfuls of them back to sunny drying spots near its den. The plants cure like hay and when the Pika later stores them in airy, well-drained quarters, they retain all winter the natural color and fragrance of well-cured hay. Also known as Rock Rabbit, the little haymaker hops like a rabbit, chews with a side-to-side motion like a rabbit, has a nose like a rabbit, and is indeed remotely related to rabbits. The true rabbit of the high elevations, the White-tailed Jackrabbit, is primarily nocturnal and not frequently seen. Very large (one and one-half times the size of the common Black-tailed Jackrabbit of lower elevations), the Whitetail turns completely white in winter and develops "snow shoes" on its feet for foraging on snow. Its droppings under matted Whitebark Pines reveal its favorite daytime resting hollows. Meadows, large and small, wet and dry, extend among the conifers of the subalpine zone. Tuolumne Meadows at 8,600 feet elevation (2,580 m), ranks as the Sierra Nevada's largest, meandering between Lodgepole Pine Forests over an area roughly 10 by 15 miles (16 x 24 km). Home to grasses, sedges, wild flowers, and small shrubs, Tuolumne and other dry meadows offer fine burrowing terrain for the high country's most obvious open land rodent, Belding's Ground Squirrel (Spermophilus beldingi). Living in groups of 10 to 200, these grayish brown, medium-sized squirrels warn of the approach of intruders with short, piercing whistles of alarm. Sitting erect on their haunches or standing upright like "picket pins," they gauge the threat and decide whether to run for their burrows. Stretching anywhere from 10 to 54 feet long (3 to 16 m) and lying 1 to 2 feet below the sod (30 to 60 cm), these burrows provide the squirrels' inner sanctum. With at least two surface openings for escape, and with the nesting portions softened by grass, the tunnels offer protection for the young, as well as secluded dens for the 8-month-long hibernation. To prepare for that hibernation, which consumes most of their year, the squirrels eat nonstop from late spring emergence to early autumn retirement. Chiefly vegetarians, Belding's Ground Squirrels especially favor flower heads, grasses, and seeds. They harvest tall grasses by pulling stems down, a paw at a time, and then lie on their backs clutching their prize. The squirrels must enter hibernation in September with their early summer body weight doubled and their body fat increased fifteenfold if they are to survive the long subalpine winter. Heavy eating and good fat metabolism are essential adaptations. The squirrels occasionally add insects, birds' eggs, small mammals, and carrion to their diet. They raid the ground nests of Mountain White-crowned Sparrows (Zonotrichia leucophrys oriantha) in willow thickets for both eggs and nestlings. Some Belding's Ground Squirrels practice infanticide, stealing each other's babies. Although both males and females kidnap and kill newborn pink and hairless pups, only males regularly eat them. Adult and juvenile Belding's Ground Squirrels both face constant danger from predators in their own meadow diggings. Weasels of similar size can easily wriggle through the tunnels. Red-tailed Hawks, Swainson's Hawks (Buteo swainsoni), and Clark's Nutcrackers watch for careless juveniles that stray too far from the dens. The transient Swainson's Hawks sometimes utilize a hunting technique of the resident Badgers (Taxidea taxus), lying in wait at a burrow's entrance to seize unsuspecting squirrels as they emerge. Badgers, along with Coyotes and bears, dig the victims out of their burrows by night. Badgers prove particularly formidable enemies. Grizzled gray, low-slung members of the weasel family, they resemble large furry turtles with broad, flat, black heads marked by a dramatic central white stripe and white lateral blazes. Ambling through Belding's Ground Squirrel colonies, they listen and sniff. On locating their quarry in the chamber below, they dig in with powerful shoulders and clawed forepaws, webbed at the back like a shovel. Excavating swiftly amid a cloud of dust, they close strong jaws on a quivering prey. Adult Badgers need to consume the equivalent of a squirrel a day to keep up their energy. A transparent inner eyelid helps them see while digging in loose sand. When pursued, they can dig themselves out of sight in slightly over a minute, throwing the soil back with the front feet and kicking it out of the hole with the hind feet in a constant stream. In poor weather they hole up in their own dens and sleep. But they are not hibernators and hunt off and on through the winter, most commonly digging out soundly sleeping ground squirrels or pocket gophers moving about in their tunnels beneath the snow. Snow does not bother the Badger, who runs over it with a swift gliding motion and can always dig out a warm meal. The inconsistent snowfall in the state's subalpine forest belt from year to year makes a big difference in the lives of much of its flora and fauna. Male Belding's Ground Squirrels usually emerge from hibernation in spring 1 to 2 weeks before the females, tunneling through deep snow to the surface. Because no food is available, they rely on what is left of their stored body fat to keep them alive until snowmelt. When late spring snowstorms hit, many squirrels starve to death. Mountain White-crowned Sparrows depend on a heavy snowpack to keep breeding meadows wet and green through midsummer. In years of light snowpack, the meadows dry out too soon. June snowstorms also slow the leafing out of willows and aspens, eliminating cover for birds' nests. Conifers bend into a horseshoe or suffer broken limbs under the weight of especially heavy wet snow. Wild flowers that usually blossom in early July may not bloom until mid-August, too late to set seeds. Dave DeSante's team from Point Reyes Bird Observatory researched for 8 years the breeding landbird community at 10,000 feet elevation (3,000 m) in the Tioga Pass area of the Sierra Nevada. From 1978 to 1985, the team observed nesting birds in prime Whitebark Pine and Lodgepole Pine Subalpine Forests. The 8 years included three with average snowpacks, four with very heavy snowpacks, and one below average. They found that timing of the snowmelt was crucial and that areas must be free of snow early enough to produce food or birds can't breed. Breeding bird territories often dropped 60 percent in the late summers following long, hard, snowy winters. Only nine species of birds proved "subalpine regulars," persisting at nests 8 years in a row, not always successfully. The nine hardy nesters were Clark's Nutcracker, Dusky Flycatcher (Empidonax oberholseri), Mountain Chickadee, Hermit Thrush, American Robin, Yellowrumped Warbler, Mountain White-crowned Sparrow, Dark-eyed Junco and Cassin's Finch. Other species that sometimes nest at that height simply moved downhill to snowfree sites when the snowmelt was late. During the past decade the content of the snowmelt has taken on life-threatening dimensions in subalpine forests and lakes of California and the West. The millions of tons of sulfur dioxide and nitrogen oxides that automobiles, smelters, powerplants, and various industries shoot into the atmosphere annually have to end up somewhere. In the air these products from the burning of coal, oil, and gasoline react with moisture and are converted into sulfuric and nitric acid. Returning to earth as acid fog, acid mist, acid rain, and acid snow, these pollutants are highly responsible for dire environmental damage. Acid rain initially drew public concern in the 1970s when research revealed that it was killing lakes in many parts of the world. Canada had lost 10,000 lakes and 40,000 more were endangered. Sweden counted 18,000 lakes sterilized. In the eastern United States, hundreds of lakes in the Adirondack Mountains were dead and several thousand more were dangerously acidic. Many were chemically comparable to vinegar or tomato juice, with no life left except a mat of acid-resistant algae on the bottom. At that time, two-thirds of United States toxic emissions occurred east of the Mississippi River. Since then, acid rain and snow have been steadily and devastatingly increasing throughout the West. A report by the National Clean Air Fund in the mid-1980s listed 10,000 western lakes threatened by acid rain. These are lakes distributed through 23 wilderness areas, 55 national forests, and 10 national parks, including Yosemite and Sequoia/Kings Canyon National Parks in California, Yellowstone, Glacier, Rocky Mountain, Grand Teton, Olympic, North Cascades, and Mt. Rainier. No mountainous area of the West is exempt. The most fragile lakes and forests threatened by acid rain (falling primarily as acid snow) occur near timberline high in the Cascades, Rockies, and Sierra Nevada, far from the sources of the pollutants which are killing them. In the Rockies, up to half of the emissions come from copper, zinc, and lead smelters in Arizona, New Mexico, Utah, and Nevada; the other major source is coal-burning electric power plants. In California, nitrogen oxides from automobile exhausts make up the chief source of acid precipitation. Carried by the wind to the high mountains, the contaminants descend with the snow. When the spring melt comes, they pour into the lakes, causing a sudden surge in a lake's acidity. This surge often comes at the precise time when aquatic insects are hatching, fish are spawning, and amphibians' jellylike eggs are in especially sensitive stages of development. The results are deadly. Even a minor change in a lake's acid content can decimate the plankton that forms the food base for all aquatic life. Frogs, toads, and salamanders, with their highly permeable skins, readily absorb toxic substances in their watery environment. Like canaries in a mine, they unwittingly act as barometers of their habitat's well-being. A recent survey of 38 high Sierran lakes where native Mountain Yellow-legged Frogs (Rana muscosa) once jumped along the banks sent an ominous message: these frogs remained in only one lake. Scientists monitoring 14 lakes at 11,000 feet elevation on the western slopes of the Colorado Rockies watched a similar story unfold. Once abundant Tiger Salamanders (Ambystoma tigrinum) lost two-thirds of their population in 9 years, the drop linked directly to increasing acid snow. Researchers believe that some of the pollutants came from automobiles as far away as Los Angeles. High Sierran lakes, along with other lakes that lie in granite basins, are especially susceptible to acid snow damage. Granite lakes lack the alkaline deposits that could buffer the acid in the way that baking soda neutralizes acid corrosion on terminals of a car battery. They have no protection at all. The trees living near these high mountain lakes may pay a heavy price for acid snow exposure. More than 9 million acres of high altitude forests in Germany, primarily fir and spruce, suffered severe acid rain damage in the 1980s from industrial and auto pollution, causing many German foresters to fear that their forests are doomed. Waldsterben (forest death) has become an all-too-common word in Germany. In northeastern United States, dead and dying skeletons of Red Spruce and Balsam Fir have turned once luxuriant forests into eerie cemeteries, the trees' needles killed by acidic clouds and mist originating in coal-burning plants of the Midwest. Acidic precipitation soaking into the ground around conifers in California's high mountains is already stunting the growth of some trees by altering the soil chemistry and reducing seedlings' ability to root. Air pollutants are known to induce biological stress in trees, weakening their systems and making them vulnerable to harm from natural stresses such as insects, drought, wind, and frost. All these deteriorating changes in subalpine life will be magnified a hundredfold if the ozone shield protecting the earth grows any thinner. The ultraviolet light that beams through holes in the ozone layer is especially intense at high altitudes. Some biologists are convinced that the dramatic plunge in amphibian populations occurring not only in California and the American West but in pristine high mountains from Switzerland to Ecuador and Australia is related to increased ultraviolet radiation. The disappearance of the beautiful little Golden Toad, the subalpine hallmark of world famous Monte Verde Cloud Forest in Costa Rica, has alarmed everyone. As herpetologist David Wake put it, "Amphibians have been around for over 100 million years. They're survivors. They survived whatever knocked out the dinosaurs. So, if they're beginning to check out, we'd better take it seriously. The same water that no longer supports amphibian populations in the Sierra Nevada is the water we drink in Berkeley and San Francisco. It seems to me there's a message here someplace. We'd better figure out what it is" (Wake 1990 : A5). Worldwide long-term studies now underway are probing for more details and answers. Meanwhile, if future life on this planet is to continue, our earth must reduce and recycle its pollutants and rid itself of the chlorofluorocarbons and related chemicals in refrigerators, air conditioners, and other appliances that poke holes in the ozone layer. High mountain lakes and forests are sending a warning to those with ears to hear. Several other distinctive subalpine conifers occupy limited disjunct ranges in California's high mountains. In the southern Sierra Nevada, Foxtail Pines (Pinus balfouriana) thrive on the most inhospitable rocky ridges and slopes near timberline. Forming pure stands of widely spaced individuals beneath craggy peaks, they typically face the savage climate of the 10,000 to 12,000 foot heights (3,000 to 3,600 m) with erect, single trunks, broad at the base, tapering to a dead, bleached tip 40 feet up (12 m). Cinnamon bark, broken into squarish plates, covers boles that slowly widen over 1,000 to 3,000 years. Figure 32. Foxtail Pines of timberline get their name from dense clusters of needles resembling a fox's tail. Longevity is also built into the short needles that clothe branch ends with dense clusters resembling a fox's tail. Like many subalpine conifers, Foxtail Pines conserve energy by retaining needles much longer than pines at lower elevations, often up to 17 years. Like other pines of the world that can tolerate extreme cold, Foxtail Pines survive the severe subzero winter temperatures of the glacial basins by draining the water from their living cells into the intercellular spaces. Only pines with this inherited capacity to "drain their pipes" can withstand the bitter cold. While the erect, often battered trunk is the Foxtail Pine trademark, occasional trees divide into multiple trunks, and some have been discovered above upper Monarch Lake in Mineral King creeping low in the squat, bushy forms of krummholz. These krummholz pines may also be found on the ridge north of Rocky Basin Lakes, south of Siberian Meadow. Although standing apart from other species is their norm, Foxtail Pines sometimes join mixed forests of subalpine conifers; at treeline on Mount Whitney, they mingle with Lodgepole Pines. Three hundred miles to the north of the high Sierran Foxtail pine forests, a separate population of Foxtail Pines thrives in scattered stands in the Klamath Mountains, Trinity Alps, and Yolla Bolly region. The two widely separated populations are believed to be remnants of an extensive Subalpine Forest that existed in California 12 million years ago when summer rainfall prevailed. As the climate changed, only the Foxtail Pines in the state's northwest corner and in the southern high Sierra survived. Southern California's subalpine zone, much drier than that of the Sierra, tends to starve and dwarf many of its conifers, especially on arid, south-facing slopes. But Limber Pine, equipped to handle steep, dry, rocky sites low in nutrients, meets the environmental challenges with ease. Basically a Rocky Mountain species, Limber Pine (Pinus flexilis) extends spottily along the high Sierra from Yosemite south, primarily on the thirsty east side. In the infrequent places where Limber Pine shares terrain with Whitebark Pine, as in Inyo County's Onion Valley, the two species look almost identical. Only the cones distinctly separate them: Limber Pine's huskier brown cones drop intact; Whitebark Pine's smaller purple cones disintegrate on the tree, leaving spindlelike cores attached to the upper branches. Ordinarily, Whitebark Pines grow in snowy timberline zones north of Mount Whitney, whereas Limber Pines occupy dry, windy sites farther south and east. On southern California's high peaks, Limber Pine forms major timberline forests. The pine's growth habits are unique. The trunk is apt to be crooked and short, with lower branches almost as big as the main trunk dipping toward the ground. Trees only 18 feet high (5 m) may have trunks 2 feet in diameter (60 cm). Young twigs are so flexible that they can often be tied in a knot without breaking. The cones carry large, heavy, wingless nuts, which Clark's Nutcrackers harvest and cache in the same manner as with Whitebark Pines to the north. Limber Pine dominates the upper Subalpine Forests of southern California's desert-facing mountains. From the Santa Rosa and San Jacinto Mountains through the San Bernardinos and San Gabriels to Mount Pinos, Limber Pines from the prominent highest altitude forests, generally intermixed with Lodgepole and Jeffrey Pines and White Fir. On Mount San Gorgonio, Limber Pine grows as prostrate krummholz near the summit, 11,700 feet (3,508 m). Lodgepole Pines also form extensive forests on the higher southern California mountains, sometimes growing clear to the top. On Mount San Antonio (Mt. Baldy), Lodgepole Pines climb out of an open, lower, stunted forest where they mix with Jeffrey Pine, White Fir, juniper, Greenleaf Manzanita, and Mountain Whitethorn to become relatively dominant in the upper forest and then form a low, matted, twisted krummholz near the summit, 10,234 feet (3,070 m). On some north-facing slopes, Lodgepole Forests shelter a special kind of subalpine meadow, the snowmelt gully, which melts slowly enough to allow seepage during a long growing season and produces a rich meadow flora, primarily Sierran. Grasses, sedges, Shooting Stars (Dodecatheon redolens), White-flowered Bog-orchids (Platanthera leucostachys) (formerly Rein Orchids), Corn Lilies (Veratrum californicum), and Lemon Lily (Lilium parryi) are part of the luxuriant parade. On Mount Baden-Powell, a particularly handsome Lodgepole Pine forest climbs the north slope to join a Limber Pine forest at the 8,634-foot level (2,590 m). The Limber Pines, scattered at first, gradually become an extensive stand of gnarled, ancient-looking trees as they take over dominance clear to the summit at an elevation of 9,558 feet (2,867 m). The understory of the Limber Pine forest includes tough, drought-resistant shrubs: tall, round-headed Curl-leaf Mountain Mahogany (Cercocarpus ledifolius) with its masses of dramatic fruits, radiant in back-lighting; Rubber Rabbitbrush with silvery green foliage augmented in late summer by brilliant golden flowers; and Bush Chinquapin with sturdy evergreen leaves and burry fruits. On the ground the pincushion buckwheats, penstemons, mints, Senecios, and other flowers adapt to the arid heights. Two miles above sea level in the White Mountains of eastern California grow the world's oldest known living trees—Western Bristlecone Pines (Pinus longaeva). Though no more than 30 feet tall (9 m), bristlecone pines have lived in remarkable harmony with their harsh environment for thousands of years. Relatively unnoticed until 1958, when Edmund Schulman announced the discovery of specimens more than 4,000 years old, they have proven amazing in many ways. Living under the most unsparing mountain conditions, 9,500 to 11,500 feet high (2,850 to 3,450 m), in an area of intense sun, ravaging winds, thin dolomitic soil and only 12 inches (30 cm) of precipitation a year (mostly snow), bristlecone pines hang tenaciously onto life. Growing extremely slowly, they add an inch or less (2 cm) to their diameter every century. Their short curved needles, five to a cluster, live up to 30 years, reducing the need to produce new ones annually, while providing a stable food source. When a part of the tree's crown is killed by winds, lightning or drought, an equivalent amount of bark and water-conducting xylem tissue dies back so that the tree keeps its food and water supply in balance. What remains is healthy. All bristlecone pines over 1,500 years old, sandblasted 95 percent bare, have only 10 inches or less (25 cm) of narrow bark lifeline running up a trunk. The beautiful wood of some of these old barkless trunks is one of the major attractions of the Schulman Grove. Its Discovery Trail passes dozens of ghostlike trees with silvery white branches stark against the deep blue sky, cinnamon-colored trunks with curling grain, soft beige trunks with black grain, and swirls of rich red-orange wood. Not all bristlecone pines live so incredibly long, to become 40 centuries old. The trees that form fairly dense forests on the moister northfacing slopes in the White Mountains grow straight and even, usually dying of heart rot in 1,000 to 1,500 years. It is the oddly shaped trees living on the driest, toughest sites that live the longest. The narrow ribbons of bark on their trunks forcibly slow their growth, resulting in dense cells and abundant resin. This dense, resinous wood seems to be what supports life for millennia, as in the case of the 4,700-year-old tree named Methuselah. Even after death, a bristlecone trunk may not fall for an additional 2,000 years. And when it does topple, its wood on the ground may endure another 4,000 years. Bristlecone forests reveal at a glance the kind of soil underfoot. The bristlecone pines scatter in groves on the pinkish white dolomite, unbothered by its high reflectivity and alkalinity or its low supply of potassium and phosphorus. Companion Limber Pines and a sagebrush understory grow mainly on adjacent granite, some Limber Pines attaining 1,600 years of age. Bristlecone and Limber Pines look somewhat alike in their twisting forms. Both are five-needle pines, but Bristlecone Pine needles grow in a stiff, distinctly bottlebrush pattern and their cones form sharp bristles. Limber Pine needles form dense tufts at the ends of short branches and their cones lack bristles. Figure 33. Western Bristlecone Pines, the world's oldest trees, grow in shapes dictated by the harsh environment of mountain heights. Golden-mantled Ground Squirrels scamper among down trunks. The Western Bristlecone Pine forests in the White Mountains are the most westerly extension of these primarily Great Basin trees found over high arid mountains in six western states. As in all of California's Subalpine Forests, they consist of the hardiest survivors. Each conifer anywhere in the state's high country adapts in its own way to the strong, desiccating winds, the prolonged cold, the short growing season, the sterile, shallow soils, the scarce water, and the sheltering boulders of mountain heights. Each depends on either the wind or on birds and mammals to distribute its seeds. Each tends to live an uncommonly long life, improving the odds for producing offspring that will be lucky enough to germinate and grow in one of the few favorable spots. Western Bristlecone Pines, ruggedly sculptured, richly colored, a notch above in endurance, unquestionably add the "crème de la crème" to California's Subalpine Forest domain. From majestic Redwoods to ancient Western Bristlecone Pines, California's trees have long inspired artists, poets, naturalists—and real estate developers. 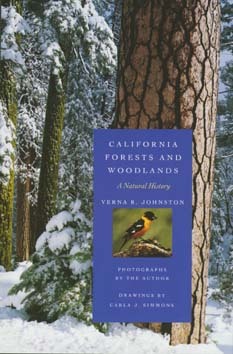 Verna Johnston's splendid book, illustrated with her superb color photographs and Carla Simmons's detailed black-and-white drawings, now offers an unparalleled view of the Golden State's world-renowned forests and woodlands. In clear, vivid prose, Johnston introduces each of the state's dominant forest types. She describes the unique characteristics of the trees and the interrelationships of the plants and animals living among them, and she analyzes how fire, flood, fungi, weather, soil, and humans have affected the forest ecology. The world of forest and woodland animals comes alive in these pages—the mating games, predation patterns, communal life, and the microscopic environment of invertebrates and fungi are all here. Johnston also presents a sobering view of the environmental hazards that threaten the state's trees: acid snow, ozone, blister rust, over-logging. Noting the interconnectedness of the diverse life forms within tree regions, she suggests possible answers to the problems currently plaguing these areas. Enriched by the observations of early naturalists and Johnston's many years of fieldwork, this is a book that will be welcomed by all who care about California's treasured forests and woodlands. Verna R. Johnston's work has appeared in Audubon, The Christian Science Monitor, and The New York Times, as well as in two earlier books. She taught biology at San Joaquin Delta College for thirty-seven years and now lives in the midmountain forests of the Sierra Nevada. Carla J. Simmons is a freelance artist in the San Francisco Bay Area.